Highly Allocated Spoiled Rotten. Yup, that's what HASR stands for. Apparently it refers to Terry Kakazu, who opened HASR Bistro and HASR Wine Co (both next door to each other). She used to share the courtyard with the old Grand Café and Bakery, but after that closed, she hopped on it and opened the Wine Shop. It's become so popular and convenient that people buy a bottle of wine and take it next door to enjoy with the delicious food. The delicious food that Chef Rodney Uyehara (of the old Bistro at Century Center and Moana Surfrider) now serves up at HASR. He has a knack for creating the most rich and melt-in-your-mouth food. Talk about the most tender Short Ribs and creamiest Risotto, topped with a big bone of dripping, oily bone marrow. So tantalizing. I have yet to try his Osso Bucco, but I hear that's a showstopper as well. Did I mention the Escargot and Mushrooms? I've tried many restaurants' traditional way of making Escargot, served in hot ceramic escargot dishes with lots of butter, garlic, and shallots. However, HASR's is different and unique, and that's why it's become my favorite. Made with Pernod Garlic Cream, you will praise the Lord after taking a bite. And you will thank the Lord even more for the crispy Crostinis it comes with to dip and drench in the sauce, because you will want to lick the plate dry before the waiter takes it away. Yes, it is that good. A couple nights ago I had the pleasure of meeting both Kakazu and Uyehara. Amazing, down-to-earth, and the friendliest people! After sampling 5 wines at the wine shop, I now understand the HASR acronym and why it applies to Terry Kakazu. She's so damn spoiled rotten for being able to get her hands on all of those hard-to-get wines in her shop! And Uyehara, equally as friendly and talkative, and I hear he likes to golf. My kind of guy! Parking- Park in the Municipal Parking Lot on Beretania and Nuuanu after 5pm and it's only $3. Come up from the elevator, and you're literally steps away from HASR! Easy peasy. And you know that's what I like, especially in downtown! Other mentionings- Buy a bottle at the wine shop and no corkage fee if you're eating next door. Wine tasting is also Tuesdays and Fridays from 5-7pm. I highly recommend it before eating there. We bought a bottle that we sampled and it was perfect! Service is A+. Ask for Aaron if you can! This has got to be one of my favorite places to eat and drink at the moment. Not only is the food so choice, but I love the ambiance of sitting outside, especially this time of year. The weather was absolutely perfect last Tuesday, and I could have stayed here all night. Seafood Pan Roast- Scallop, Prawn, Crab, Calamari, Mussels, Clams, Fish, Chili Saffron Tomato Cream Sauce and Rice. No skimping on seafood here!!!!! The bowl was gigantic! Braised Short Rib- Pesto-crusted Bone Marrow, Hamakua Mushroom Risotto. The Risotto and Short Rib were simply amazing and drool-worthy. I don't think there was a drop of risotto left! The marrow looks drool-worthy and I was most excited about this, but it fell short. It had no taste and it was just fat. A letdown on the marrow front, since I'm a huge bone marrow lover. Key Lime Cheesecake. OH-SO light! You won't believe how light this cheesecake was. And the key lime was perfect- not too overpowering, but a subtle refreshing flavor. This was my favorite. Banana Bread Pudding. You could definitely taste the banana bread, but I was head over heels for the Key Lime Cheesecake above. 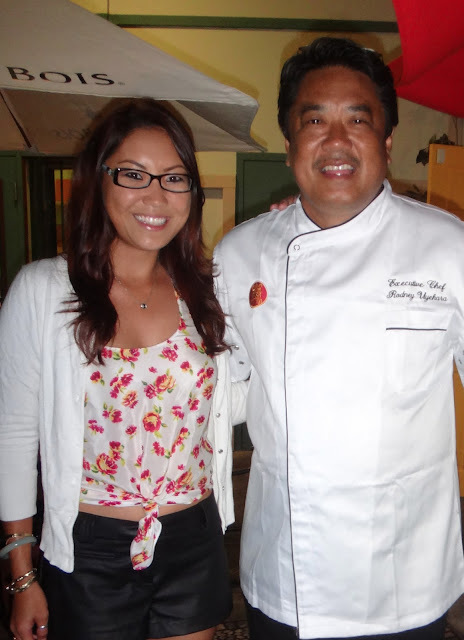 Chef Rodney Uyehara and I!